It’s been a couple of days into my South Asia trip and I’m loving all of Vietnamese cuisine’s traditional ingredients like lemongrass, Saigon cinnamon, and fish sauce. The endless bowls of Vietnamese noodles I’ve consumed (cooked in so many different broths I’ve never tasted before) only add to the fun! From trying Vietnamese street foods on the back of motorbikes to visiting the gorgeous Saigon Central Post Office designed by Gustave Eiffel, Mizuha and I have had a wonderful time getting to know Ho Chi Minh City. With a colorful culture and diverse cuisine to boot, Vietnam is definitely a country I would love to go back to. As I wrote previously, Mizuha and I will be traveling to Cambodia and Thailand as well, so this is Part I. of my South Asia adventures. Which also means, there will be a lot of colorful photos in each post and hopefully they will do their magic and help me narrate what adventures I experience in each city! Although I didn’t include every single place we visited, such as the War Remnants Museum and the Reunification Palace, hopefully these highlights will show a bustling side of Ho Chi Minh City Mizuha and I enjoyed. So without further ado, here are my highlights from Ho Chi Minh City, Vietnam. Enjoy! Tip #1 for first timers: if locals eat there and others pull up chairs to sit there, it’s probably a decent stall! Mizuha and I found our first breakfast spot: Pho! The most impressive noodle elasticity ever–it was delicious!! Mizuha and I were looking for post-breakfast dessert and found the perfect stand outside selling fresh fruits. This is Mizuha buying her first ever jackfruit! Ben Thanh Market can be a tourist hub at times, but it’s definitely worth a visit if you head there in the morning for some breakfast before heading to the War Remnants Museum and the Reunification Palace just close by. Plus, the sheer amount of food stalls and market stands in the area makes it a wonderful place for photography. Meeting ‘the Lunch Lady’ and her Monday stew! With the help of Anthony Bourdain, The Lunch Lady has become one of Vietnam’s most famous street food vendor. Naturally, Mizuha and I had to follow suit and try out her famous daily menu. From the pictures, you’ll easily see why we were wowed by the food. Although the Lunch Lady has significantly expanded her business in the past couple of years, she hasn’t lost her magic touch! We were the only foreigners dining there that day, and were completely fascinated by the diverse groups of office workers, local students, and other diners that stopped by the stall for lunch. In particular, we noticed on every table there were mugs of dark green juice accompanying bowls of noodles. After some hand motions and many lost English words, a lovely Vietnamese women in a fabulous LBD behind us helped us out. She even offered her drink to me! After some embarrassed ‘no thankyou’s,’ I ended up sipping her glass, fully aware of the tables of Vietnamese diners glancing at our entire exchange. Funnily, not only did I actually like the refreshing spinach-like juice, our fellow diner ended up ordering two glasses for us. The identity of this green juice turned out to be Vietnamese Pennywort Juice. Ever had it before? It definitely was our first time! Perfectly fried and crispy pouches! Look at this wonderfully colorful and delicious lunch table! And lastly, the Lunch Lady hard at work! Stop by and visit the Lunch Lady for some delicious food, even if it’s a little further from where everything is. It’s definitely worth the trek and if you’re lucky, you’ll have some delicious noodles and spring rolls! Mizuha and I really don’t think she’s lost any of her magic despite being much more popular now. Plus, there’s nothing more fun than interacting with some locals and finding out new things like the Pennywort Juice! Zipping through the Saigon street eats on the back of motorbikes! If street food is what comes to mind when one thinks of authentic Vietnamese food, then motorbikes zipping through Ho Chi Minh City’s roads are the emblem of every day life. Mizuha and I are dedicating this South Asia trip to experiencing a slice of every city’s daily life, so naturally getting on our first motorbikes in South Asia was a must (tuk-tuks are also a big part of traveling through these cities too of course)! 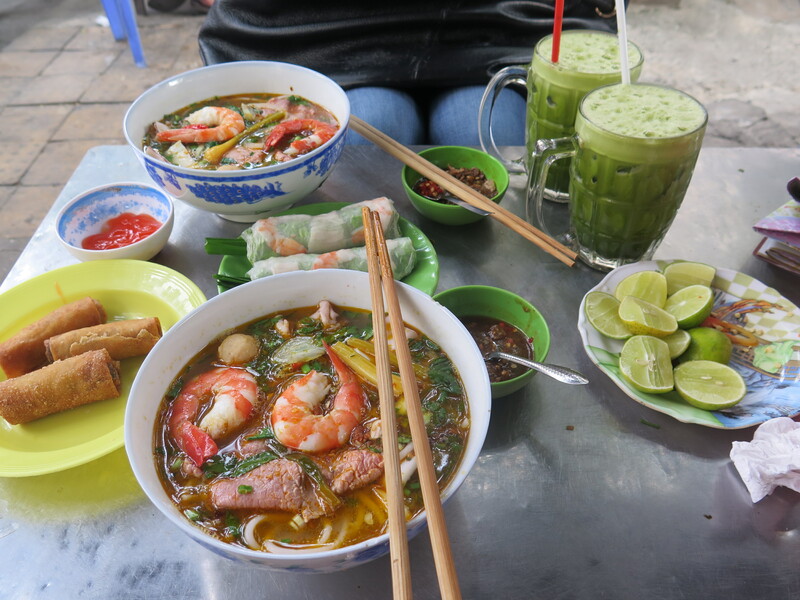 Through reading raving recommendations, we found the perfect tour: Back of the Bike Tours, Saigon Street Food Edition! These tour guides, or should I say a wonderful group of friends, really know their way around Ho Chi Minh City. Not only are they locals, their impeccable English and hilarious sense of humor really make the experience wonderful. My guide was a wonderfully outgoing and charming 25-year old whom I talked about everything with. From Vietnam’s marriage culture to which foreign country’s men is the most charming, we had a blast getting to know each other while sampling a HUGE array of Vietnamese food. We tried so many different things, including foods I would never otherwise touch. Mizuha showcased her eating prowess (more like her openness to eat all types of foods!) by being a champ and wowing our entire tour group with her ability to consume a 15-day old duck embryo without batting her eyelashes. What’s left of our papaya salad and beer lunch on the pavement by where we crouched! You wrap the banh khot in the leaves and add some chili and fish sauce with it. It’s a completely new taste and texture, but absolutely delicious and crunchy! A challenge after the meal: 15-day old duck embryo for the daring! Inside of the egg–as squeamish as I was, the duck egg yolk wasn’t too bad! Traffic started picking up mid-afternoon. People get REALLY close to you on the streets! Banh Canh Ghe: Ocean Crab Soup with tapioca noodles with fried fish cake. This was my favorite dish! The crab was delicious in the green chili sauce they gave us on the side, and the broth was super tasty. Apparently a super popular drink: a tomato smoothie that had a hint of guava in it! Dipping a Vietnamese cherry in chili mixed with sugar! But when we don’t eat, we explore Saigon of course! As endless as our stomachs seem, we definitely do have a I’m-stuffed-and-I-cannot-eat-anymore-point! So when we aren’t eating, we spend our time getting to know the historic and gorgeous city of Saigon. Here are some highlights and my favorite candids Mizuha and I caught on camera. A lot of these beautiful photos are curtesy of Mizuha’s new Fuji film camera XE-2 that she is testing out. We ended up visiting Saigon Opera House by watching the AO Show which showcased Vietnamese culture via a young crew of talented young adults. Although some of our visits to places like the Reunification Palace, War Remnants Museum, and the famous Caravelle Hotel’s Saigon Bar are not included, they are definitely places not to be missed! A group of teenagers practicing and playing their guitars while singing! Well-preserved and serene, definitely worth a short visit! A vendor that has mastered the art of balancing donuts! The inside of the post-office, with old-school telephone booths still! Cheers! Drinking our coconuts on a bench by the park, while staring at the Reunification Palace! Our first picture together since arriving! So lucky to be traveling with this fun-loving and lion-hearted friend who can eat everything with me! With our Vietnam part of the trip just concluded, Mizuha and I are in Cambodia now. We just finished exploring Phnom Penh and are headed to Siam Reap today! Excited to see our take on Cambodian foods, culture, and relics? Watch out for Part II. Cambodia: The Kingdom of Wonders. You really captured the beauty of Saigon in this relatively short trip! That crab noodles was my favorite ! thankyou for stopping by! the crab noodles were amazing, I wish I could eat another bowl of it! it was great reading about your trip to Ho Chi Minh! never heard of pennywort juice – loved that story by the way 🙂 reminds me about one of the great things about traveling – the people you meet along the way! i didn’t know that the post office was designed be Eiffel! and those desserts (purple sticky rice with ice cream!) all looked yum! drooling here!